I've had this film in my "to watch" pile for quite a while now. It was a surprize gift and I'd never seen it before. This weekend it was finally time to sit down and see what it was all about. I wasn't sure what to expect but a thriller involving Robert DeNiro has to have some potential. What if there was a drug which could unlock the full potential of your brain? What would you do? Quite a lot of complicated things according to this film, especially when it's a drug you're not supposed to be in possession of. I really enjoyed this. There's lots going on and lots to think about, a very good story. 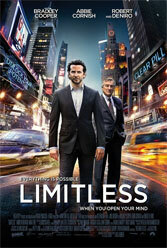 There are also some excellent visuals as well combining multiple shots in to an impossible single "limitless" zoom. Great stuff, recommended.